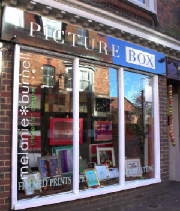 Picture Box offers a vast selection of original and printed artwork to suit all tastes, from abstract to traditional. choose from over a thousand frames and mounts, turnround time typically within a week. We offer conservation framing and have a range of specialist glass available. Photo to canvas service at competitive prices, e-mail or call in for a quote. Copying and reprinting or artwork service available at competitive prices. We offer the full range of Nielsen Metal frames. Gillian Smith and James Davey are displaying a range of work. We have recently taken delivery of a great new range of frames both wood and metal drop in and see us and discuss your framing requirments. We specialise in framing items such as Football Shirts, Balls, Medals, Jigsaws, Cards, Gig tickets etc. You name it we can frame it!! Tuesday 23rd April - Normal opening resumes.